MANTOLOKING, N.J. -- A new study looking back over 1,000 years finds the flooding risk along the New York and New Jersey coasts increased greatly after industrialization, and major storms that once might have occurred every 500 years could soon happen every 25 years or so. The study by Penn State, Rutgers, Princeton, and Tufts universities, and Massachusetts Institute of Technology, finds that flood heights have risen nearly 4 feet since the year 850, largely because of a sea level rise. The study advocates better risk management strategies to cope with storms. It was released a month before the third anniversary of Superstorm Sandy, which devastated the coasts of New York and New Jersey. "A storm that occurred once in seven generations is now occurring twice in a generation," said Benjamin Horton of Rutgers, one of six lead researchers involved in the study. "What we do know is that as sea level rise accelerates into the future, we are going to have more frequent flooding." The study was published Monday in the Proceedings of the National Academy of Sciences journal. Adam Sobel, an atmospheric scientist at Columbia University and author of the book "Storm Surge" about Superstorm Sandy, said this study, like many others before it, leaves little doubt that sea level rise will be more rapid than it has before. "This is just one more good study adding certainty to what we know already, which is that coastal cities around the world - including New York, but we're not the only one, nor the worst - are in trouble," he said. "This makes the direction of change certain: We are at increasing risk for Sandy-like disasters here in New York City and in many other places as well." The study does not explicitly state that the changes are due to human activity but implies it "by the timeframes," Horton said. The researchers wanted to compare recent decades to the period before the Industrial Revolution. "The climate community knows the conditions were different in the last 30 years than they were in the last 1,000," he said. The researchers said that in a changing climate, future inundation of the United States' Atlantic coast will depend on storm surges during tropical cyclones and the rising sea levels on which those surges occur. However, the record of tropical cyclones in the North Atlantic basin is too short to draw meaningful conclusions, from 1851 to the present. To reconstruct sea levels for earlier periods, the research team used microfossils, called foraminifera, that were preserved in sediment cores from coastal salt marshes in Cape May Court House and Galloway, New Jersey. The ages of these cores were estimated using radiocarbon dating and other techniques. "Every inch deeper in a core takes you further back in time," Horton said. "We can stretch this technique back hundreds of years and thousands of years." The study went as far back as the year 850. It found that changes in tropical cyclone characteristics have led to increases in the extremes of the types of storms that create the largest storm surges for New York and New Jersey. 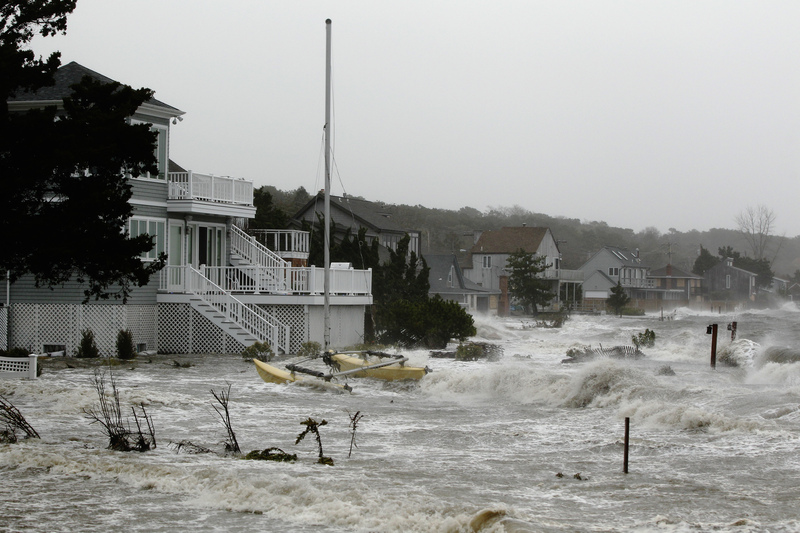 The next phase of the research, led by Andra Reed, a doctoral candidate at Penn State, will use the data gathered to predict sea levels and hurricane activity and when major storms like Superstorm Sandy might strike.